TSS PRO 400 is a premium quality product for applications where a superior, wet look, glossy shine, fast drying and excellent durability are a requisite. TSS PRO 400 beautifies stone, brick, mortar, masonry, concrete structures and concrete aggregate providing a vibrant, rich, high gloss wet look while protecting and preventing deterioration. Great for patios, pool surrounds, landscaping accents and for most masonry and concrete surfaces. NOTICE: This product is not VOC Compliant. Consumers in VOC regions CAN purchase only 1-quart bottles of this product. However, consumers in AZ (Maricopa County), CA, CT, DE, IL, IN, MA, MD, ME, NH, NJ, NY, OH, PA, RI, VA (Northern), VT, Washington, D.C., and Canada can NOT purchase 1-gallon and/or 5-gallon bottles of this product. TSS400 is an industrial strength, high gloss polymer sealant that protects against efflorescence, vehicle fluid, and oils. It is a user friendly, silicon and acrylic combination polymer, protecting concrete and pavers, while augmenting the stones rich natural color. TSS400 comes ready to use, with a fast-drying process that will leave you with a transparent barrier against deterioration. 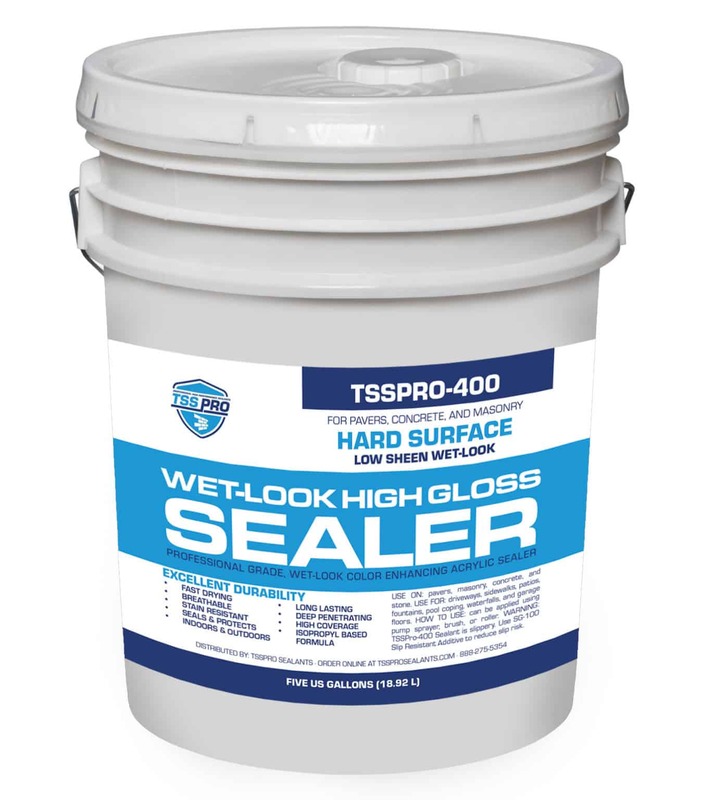 TSS Pro-400 Glossy Sealant is Slippery, Use SG-400 Slip Resistant Additive to Reduce Slip Risk – You can simply add the SG-400 sealer grit additive to your order to apply TSS Pro-400 High Gloss WetLook sealant safely in wet areas. What Is TSSPRO-400 High Gloss WetLook Natural Stone Sealant? At its core, TSSPRO-400 High Gloss WetLook is a wonderfully unique, deeply penetrating solvent-based sealer that utilizes a breathable, acrylic polymer to your full advantage. It’s designed from the ground up to give a rich, wet look to your natural stone when only the highest gloss, superior look will do. Because of its unique chemical composition, TSSPRO-400 High Gloss WetLook is perfect for use around pool decks and as a swimming pool coping sealer, on waterfalls, on outdoor stone fascia, brick, concrete, and masonry like brick steps or chimneys. TSSPRO-400 is a chlorine and saltwater resistant sealer, also capable of repelling motor oil from staining concrete driveways and garage floors. However, TSSPRO-400 High Gloss WetLook is NOT recommended for limestone. Instead we recommend TSS Pro-200 sealer for limestone because it’s perfectly suited for use on soft or porous stone such as lueder?s limestone, moss rock, sandstone, and other porous stones. TSS Pro-400 Requires a Completely Dry Substrate – TSS Pro-400 like all our wet look products, should only be applied on a completely dry substrate. If stone has had water running over it the surface may be dry, but the interior will contain moisture – be sure it is completely dry before application. Too much moisture in a stone can cause the sealer to blush producing white areas. After application, be sure stone is completely dry before turning water feature back on. How is TSSPRO-400 High Gloss WetLook Natural Stone Sealant Applied? The shiny sealant can be applied with a metal 50 psi pump up sprayer, a roller, or a brush. The most common method is to use a roller. A single coat is normally more than sufficient, and the entire surface will cure in approximately one hour. On rare occasions, a second coat may be desired. The shiny sealant can be applied with a pump up sprayer, a roller or a brush depending on your preferences. A single coat is normally more than sufficient and the entire surface will cure in approximately one hour. On rare occasions, a second coat may be needed. Of you choose the DIY approach, you will appreciate the simple process of applying TSSPRO-400 High Gloss WetLook. However, we don?t recommend applying sealant until you have had it professionally cleaned so that the formula can penetrate and protect sufficiently. Why Choose TSSPRO-400 High Gloss WetLook Natural Stone & Concrete Sealant? Use TSS Pro-400 to protect your investment. The stone in your house, backyard, or business are a long-term investment. Not only can they significantly add to the property value for homeowners, they also instantly create character and a natural, organic feel. As with any investment, stone flooring, coping, patios, and fascia should be protected. TSSPRO-400 High Gloss WetLook provides the protection against saltwater, chlorine, oil, chemicals, moisture, and sun damage that you need, but makes the stone look glossy and wet even when it’s dry. What is TSS Pro SG-400 Slip Resistant Gripping Additive? TSS Pro SG-400 Slip Resistant Gripping Additive is a proprietary blend of sand and grit for use with TSS Pro-400 High Gloss WetLook. It is a specially designed, state-of-the-art micronized polypropylene additive that provides superior abrasion and slip resistance for surfaces that have been treated with TSS Pro-400 WetLook stone sealer. The non-slip stone sealer additive offers superior protection to the surface that you?ve already made a great effort to care for through your choice of another TSS Pro product. What are the Benefits of Using Non-Slip SG-400 additive to Glossy Stone Sealant? The benefits of adding our grip additive to TSS Pro-400 High Gloss WetLook or other glossy sealant products is that you can still enjoy the shiny sealed stone finish while also providing a safe environment free of slip hazards for you and your guests. In general SG-400 slip resistant sealant additive makes sealing stone in wet areas safer. What Surfaces Can TSS Pro SG-400 Slip Resistant Gripping Additive be Used On? The superior abrasion and slip resistant properties of the TSS Pro SG-400 Slip Resistant Gripping Additive make it perfect for sealing around swimming pools including saltwater and chlorine, hot tubs, around fountains, on stone patios in humid climates or where it rains frequently, on marble, slate, or stone flooring in the bathroom or kitchen, and other areas where a large amount of moisture will be present. In essence, you’re not just protecting the stone when you add SG-400 non-slip grip additive; you’re protecting the health and safety of the people who will be spending a lot of time around that surface on a regular basis. You won’t have to worry about people slipping and falling as they rush to hop in the pool, come to the table for dinner, walk in the bathroom after a steamy shower, cook in the kitchen, or during your next backyard barbeque. What Type of Stone Can SG-400 Be Used On? Adding a slip resistant finish to stone or concrete with TSS Pro SG-400 is a straightforward process. SG-400 Slip Resistant Gripping Additive is commonly mixed with the TSS Pro-400 High Gloss WetLook immediately prior to application, meaning that you can complete both processes at the exact same time. After the two ingredients have been combined to form a high sheen stone sealant with texture for slip resistance you can apply it using the tool of your choice: including a roller, brush, or sprayer. A single coat is provides adequate protection in most cases, and the non-slip sealant typically cures in as little as one hour. Protecting the beauty and health of your stone patio, floor, pool coping, brick or garage is important, but it shouldn?t mean sacrificing the safety of your family or guests. With superior abrasion and slip resistance, TSS Pro SG-400 Slip Resistant Gripping Additive is a smart choice when using TSS Pro-400 High Gloss WetLook or another sealant on flooring or hard surfaces that could become slippery. You get the look you’re after AND peace-of-mind knowing your stone looks beautiful, is protected, and safe to walk on.